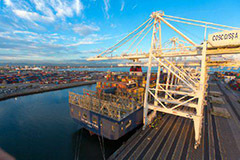 At the Port of Long Beach, the world’s greenest terminal is under construction, pioneering anti-pollution measures have led to dramatic clean air gains, and thriving sea life coexists with one of the busiest container ports in the world. 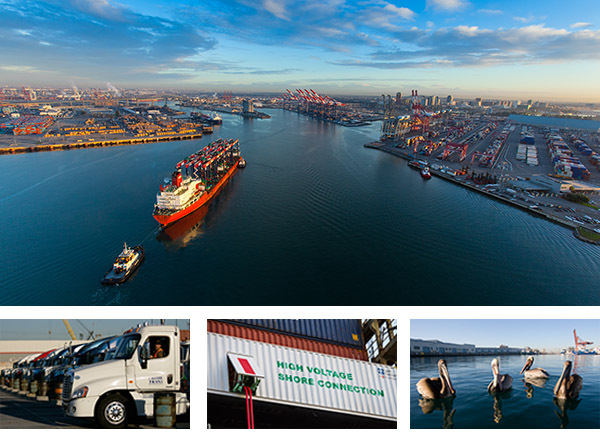 These are just a few of the many environmental successes the Port has achieved under its historic Green Port Policy, adopted 10 years ago this month. The Southern California Chapter of the American Public Works Association (APWA) has honored the Port of Long Beach with its 2014 Project of the Year in the Traffic, Mobility and Beautification category for the Port’s West Anaheim Street Improvement Project. Presented at the APWA’s Dec. 11 luncheon, the award recognizes model capital improvement and public works projects. In partnership with the Long Beach Library Foundation, the Port is planning a June 20, 2015, gala to celebrate the publication of its new book documenting the Port’s history. Authored by former ports newsletter publishers George and Carmela Cunningham, the book will be launched as part of the Library Foundation’s 12th Annual Grape Expectations fundraiser. The event will kick off traveling and gallery exhibits showcasing the Port’s history presented in partnership with the Long Beach Historical Society. The galley exhibit is planned for Aug. 7 through Nov. 1 at the Historical Society, 4260 Atlantic Ave. in the city’s Bixby Knolls district.